Pottery themed monotype included in exhibit. Members of the South Shore Art Center are invited to exhibit one of their pieces for this exhibit. One of my new monotypes will be on view. It’s from a series of pottery forms integrated with organic elements and inks that are shimmery and textural along with embossing. In the past few years I’ve become a ‘pottery junkie’ seeking out potters locally that inspire me with their forms and earthy designs. A large part of the process is letting go of a preconceived idea of the finished piece which goes through a glazing and firing that is transformative. Some of my favorite haunts are local pottery, Ann Schunior Pottery, Bob Green Pottery and, of course, Pucker Gallery. 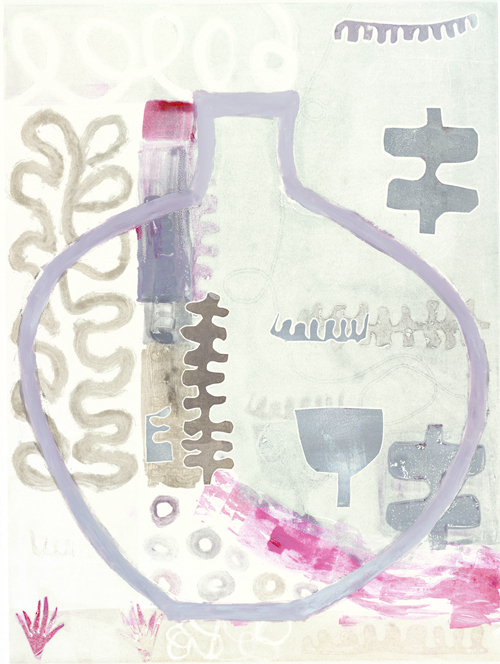 Please visit this Blue Ribbon Members’ Show and look for this original monotype inspired by ceramic forms and nature. You are currently reading Blue Ribbon Members’ Show at donna ingemanson studio.